Raiders’ first premiership win in 1989. Photo: Canberra Raiders. It is no wonder Raiders coach, Ricky Stuart, has urged his current team to channel the performance of the 1989 premiership winning side. They’ve won three titles, but this one was special. 1989 is a season etched in the memories of Raiders supporters ahead of the other two premierships for a number of reasons. The most obvious: It was the Raiders’ first title since joining the NSW Rugby League in 1982. Further to this, there was a dramatic conclusion to this 1989 Grand Final, as it went into extra time to seal the premiership for the Raiders. And I will never forget Steve Jackson’s amazing try. A pure act of determination to get over the line! Then there was the outpouring of emotion from the Canberra community. Thousands crammed into Canberra Airport waiting for the team to arrive home. If you remember, the airport was much smaller then, and the crowd really did dominate the building. And who could possibly forget Laurie Daley dropping the trophy, resulting in hurried repairs before a reception at the Lodge? But for me, it is what happened behind the scenes that made 1989 even more memorable. It’s easy to forget that the Raiders had an indifferent start to the season, losing the first game to the Sharks 32-14. I well remember the day and the sombre mood in the dressing room afterwards. Dean Lance captained the side on that day, and after two losses to start the season, they then won seven in a row, followed by a loss to Newcastle in Round 10. By round 11 Mal Meninga has effectively taken over as the skipper although the captaincy for the season changed between Meninga, Lance and Belcher. Effectively though, Meninga captained all games from round 18, except for round 21, when Dean Lance skippered again. It was a roller coaster season. The Raiders had six losses in the eight games between round ten and round 17 and their chances of making the final five appeared to be rapidly diminishing. No one gave them any hope of making it through to the finals. There was also speculation that Tim Sheens’ future as coach was being discussed but powerbroker, John McIntyre, ensured there was no move against the coach. The players, meantime, had little time to be caught up in what was happening off the field as the majority had full-time jobs. Garry Coyne had the video shop in Queanbeyan, Glen Lazarus was selling cars at Philip, and John Ferguson, from memory, was involved in fire prevention. They then trained a couple of days a week at night at Seiffert Oval until about 9:30 pm. There was little of the public pressure we see in the game today with only two games a week televised. The players were semi-professional at best and there was no social media, although plenty of enthusiastic media were easy to find. After the loss to South Sydney in round 17, the Raiders were given virtually no hope of making the finals. Then the miracle occurred. The Raiders went on an incredible five-game winning sequence to make the top five. To win the premiership they would need to win the next four. In total, Canberra needed to win nine games in a row to gain the title. And they did! 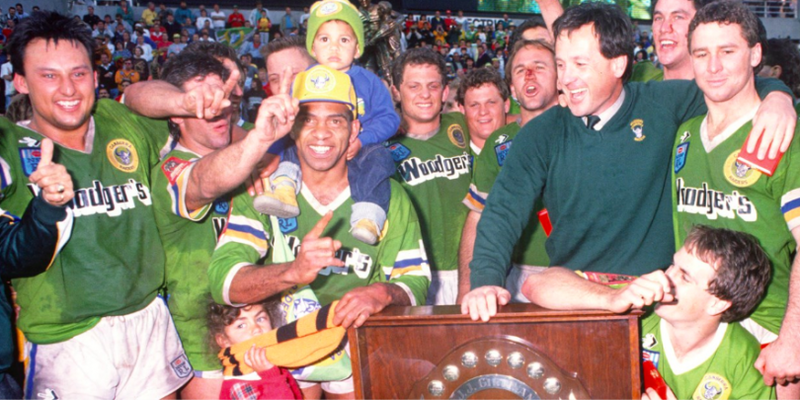 In achieving this feat in a Grand Final, regarded as the greatest of all time, is the reason why Ricky Stuart has called on his team to embrace the legends of 1989. The fact that he was a key player in that first premiership means that he has a comprehensive and practical understanding of what the team went through. Let’s hope we see the same determination of spirit in the 2019 team. Already the signs are promising. I regard that year of 1989 the year that Canberra turned the corner. When we stopped being the big country town and became a true city. TV aggregation in March when we no longer had the one hick station, the Raiders’ victory in September. It was a watershed year in our history. During the 1980s it was all leading in this direction. At gym I worked out with members of the Raiders and workers from the New Parliament House site. We met them socially and had encounters with them. But as the car horns rang out when the Raiders won the 1989 Grand Final I thought “This is it. We’ve finally made it”. We had a lot of achievements in our just over 100 year history but the Raiders winning that Grand Final was the one that established us. When I moved here as an 11 year old in 1970 I never thought that by the time I was 30 we would not only have a team in the NRL competition but we would win it as well. The Raiders with that victory paved a highway across the Australian sports landscape which other teams were able to follow. The Brumbies, The Capitals, The Cavalry, The Cannons. A truly incredible achievement. What a great season for Canberra as a community and what a great season for rugby league as a sport. Where to now for the Raiders? Please Ricky, what’s the cure for the Canberra Raiders close losses epidemic?